I have had a few enquiries recently about our English speaking playgroup. So I thought we might take advantage of this beautiful weather to meet again this Saturday October 4th 10 am at the NordPark playground. So do come along if you are interested in meeting other English speaking parents and kids. For people looking for local bio / organic produce, Kirstin recommended Bio Hof Gut Wilhelmsdorf. They have an on-line shopping and delivery service where you can shop for regionally sourced fruit, vegetables, cheese, meat as well as many other bio items. Or you can choose a box where they preselect the ingredients for you. The menus change each week and they offer around 6 difference choices to cook at home, as well as the usual fruit & veg boxes (they are all under ‘Sortiments – – Koch – Kisten’, first item on the online shopping menu) They also have a farm shop you can visit, along with cafe and kids playground. One of the fun things having been away from Bielefeld for six months, is discovering all the new places that have opened while I was gone. 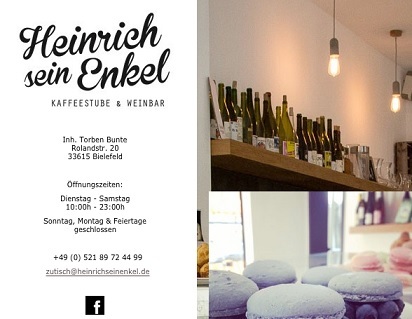 I saw this cute new cafe & wine bar on the corner of Siegfriedplatz this evening – Heinrich sein Enkel. They specialise in natural wines (there’s also a wine store) along with simple homemade light dishes such quiche, cheese and baked goods. Everything looked delicious and the place had a nice atmosphere. I will definately be visiting for a glass of wine and dessert soon. You can see photos and a review in German here and here. 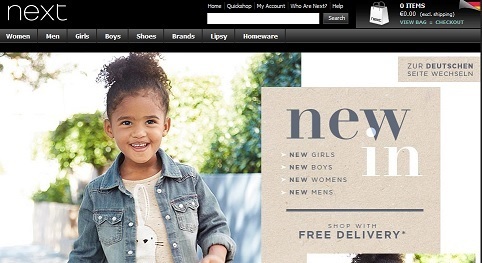 I often buy my kids clothes from England as there is no tax on kids clothes & shoes there. Also because here in Bielefeld I haven’t been able to find much in the middle price range between H&M and designer (with two boys, the clothes get passed down so I’m looking for better quality then H&M). My favourite shop in the UK is Next, their boys clothes come in good designs, their basic pack of 3 or 4 shirts is good value, and they last repeated washing. In the past I have ordered from their English website but I noticed they now have a german website and you can view it in English too. They have free shipping for orders over €20 to Germany and free returns too! Coming from the UK, I love doing my supermarket shopping online (offered by all the big British supermarkets). So I’m very excited to see Rewe is offering online shopping and delivery here in Bielefeld for orders over 40 euros. The prices are same as in the store, and the online selection has just about everything I usually buy. The first three deliveries are free and after that’s it’s between 2 – 7 euros depending on delivery time. At the moment though all delivery slots are only 1 euro. They offer two hour slots to choose from and delivery up to 9 pm in the evening and also on Saturdays. Stairs are no problem. You change and add things to your order until the day before. I look forward to trying this out and having my shopping appear in my kitchen! I will report back soon. UPDATE: My order was easy to complete on-line and turned up on time. Frozen goods were still frozen too. I will definately continue to use them for my weekly shop. I love Bielefeld’s spin off of Pharrell Williams’ Happy video!! Osnabrück Zoo is a great day out with kids. It’s about 45 mins drive from Bielefeld and a brilliant zoo with giraffes, lions, elephants, monkeys etc all split into different geographical zones. There are several good playgrounds too for both little kids and older ones. It gets crowded on weekends so go early. We spent several hours there and still didn’t manage to see everything. There is a winter discount at the moment until end of March. 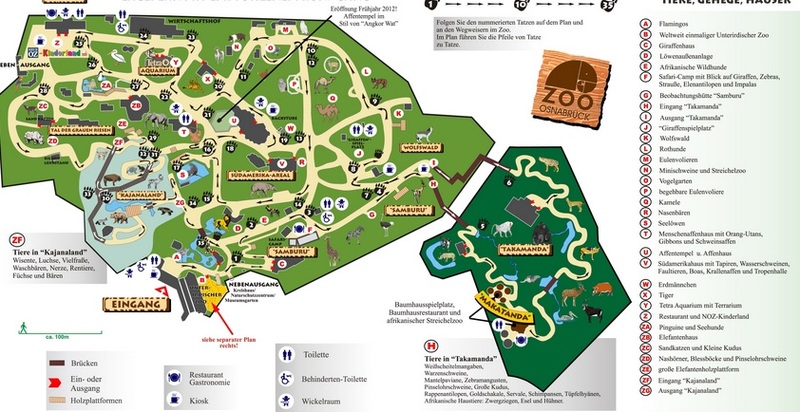 Next time we hope to check out the ‘all weather’ Münster Zoo (English website), they have covered walkways and you get to feed the elephants and other animals! Plus they take the penguins out walking.